Driveways do more than just connect the road to the garage or car park. It is one of the elements that contribute to curb appeal. It has to look aesthetically pleasing to make that drive home feel like a warm embrace. If you have a concrete driveway, you know how unappealing it could be especially when signs of damage start popping out. Before you even think about replacing the whole slab or covering it up with asphalt, consider decorative concrete first. You would be impressed at how economical, durable, and aesthetically pleasing your driveway will be after a good resurfacing. Cracks – This is the most common issue on any concrete surface, however, driveways can get worse with all the traffic and climatic changes it is exposed to. There are two types of cracks: working and non-working. Working are those that recur, often caused by regular movement under the slab. Non-working are those that do not recur. Spalling – This is often caused by freeze-thaw damage. Concrete is very porous. When water penetrates the slab and the temperature drops to freezing levels, the water expands and compresses repetitively due to freezing and thawing. This could weaken the surface and cause it to disintegrate. Stamped Concrete Overlay – With the use of stamp mats, patterns are imprinted on a thin overlay installed on an existing concrete driveway. The cool thing about this is that it can be made to look like more expensive materials, such as running brick, flagstone, fractured slate, pavers, and more. Hand-staining it can make stone impressions a lot more realistic. In concrete stamped driveways, grooves of the imprinted pattern help improve grip or traction, making it a safer surface to drive on. 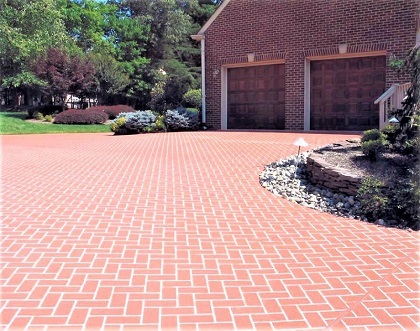 Stained Concrete – If the driveway is still in good condition but you are looking to update its look at an economical cost, concrete staining is a highly recommended solution. Acid and water-based stains come in a variety of colors that driveway owners can choose from. Spray Texture – This acrylic concrete coating is sprayed on the driveway and then troweled down to make the stucco-like texture more subtle. Although this troweled concrete finish is often used on concrete pool decks, it is also ideal for driveways because of its ability to reflect heat. This means no matter how long the driveway is exposed to sunlight, the surface stays cool enough to keep rubber tires from melting. A spray knockdown finish can be customized further with expansion joints or scorelines if you think it needs more traction. One of the reasons why home and business owners prefer decorative concrete is that it is less expensive than other paving and flooring options. A driveway resurfacing or refinishing job costs less because it makes use of the existing slab, uses fewer new materials, and takes a short period of time to complete. There are, however, factors that could affect the cost. Level of surface preparation needed. This includes cleaning, concrete driveway repairs, stripping, etc. Any additional service like custom scoring, hand-staining, and more. Transform your concrete driveway from drab to dazzling. Call (773)377-8976 for more options. Who wouldn’t want to drive on an awesome driveway? A concrete driveway resurfacing not only enhances curb appeal but also increases the property resale value of your home. We at Chicago Concrete Resurfacing are committed to providing top quality driveway solutions that make lives easier and more enjoyable. Our highly trained team takes pride in the work we do. Each surface is treated with utmost care as if it is our own. We pay great attention to detail, making sure that every single inch is installed meticulously. But don’t take our word for it. Call or email us. We’ll give you a free consultation and price quote, too.